We are so pleased and excited to share that Sarah Moorehead, Interim Executive Director and Agricultural Outreach Specialist, was awarded the 2018 Washington Association of District Employees Employee of the Year award at the 2018 WADE Conference. Our staff nominated Sarah for this award because of her unending support as a supervisor and her dedication to local conservation efforts in Thurston County. Sarah joined Thurston CD as an intern in 2007 and since then has worked in a number of roles, taking on the position of Interim Executive Director in July 2017. We’re thrilled that the WADE Board agreed with us that Sarah deserves some recognition and accolades for her hard work. Congratulations, Sarah! We would like to congratulate our District Administrator, Kathleen Whalen, for receiving the Washington Association of Conservation District’s 2014 Special Service Award, at the WACD Annual Meeting, held in early December. David Vogel, Executive Director, and Alan Stomberger, President of WACD, presented the award and acknowledged Kathy’s service by stating, “In addition to serving as District [Administrator] for the Thurston Conservation District, Kathy has served four years as President of WADE [Washington Association of District Employees]. She had dedicated endless hours beyond her local district’s workload to advance the ideals of partnerships, and professional education of conservation district employees – and [district board members]. Kathy has represented the interests of technical, professional and administrative district employees and has tirelessly promoted the advance of conservation by all of Washington State’s districts.” Congratulations Kathy! And, we commend you for your efforts to further the mission of our own district, while supporting employees of conservation districts across Washington State. Brian Thompson, Resource Specialist, received the 2012 Southwest Region Employee of the Year! Brian has been with TCD since February 2000, and is retiring this fall. He has been a well respected member of the TCD team, and his role as Resource Specialist does not fully capture all that he does. He manages the District’s Equipment Rental and Soil Testing programs. These two programs have successfully increased the visibility of the District within the community, and helped countless cooperators put conservation on the ground. As a Certified Crop Advisor, Certified Planner and licensed pesticide consultant, his exceptional skills give him the ability to work with any type of cooperator or co-worker. without conflict. These skills, along with his background in farming and forestry make him a valuable resource to our cooperators, and as such, he is regarded as the “go to” person for answers. Fred Colvin, Board Member, received the 2011 Southwest Region Supervisor of the Year! Fred has served on the District board since 1997. He quickly learned the ropes and within just a couple years, he became well known across the state and a strong advocate of farmland preservation. He is a great resource to the ag community and policymakers along, and is well respected. Fred served as the WADE president from Dec 05-Nov 07. The single most important accomplishment Fred made during his presidency was to implement the Budget Request strategy into one activity administered by WACD.Over the last few years, the “promises made, promises kept” slogan has been well received and, in part, is a legacy of Fred’s vision. Fred has served on several committees related to agriculture. Most notably, he has served on the Thurston County Ag Committee for over 20 years. Fred continues to be a very active voice for agriculture today. Fred is an outstanding example of someone who does not just walk the walk – he talks the talk! Anne Mills, South Sound GREEN Coordinator, received the 2011 Southwest Region Employee of the Year! Anne has been with TCD since September 2002 and coordinated with the South Sound GREEN student education program and plans to retire in May, 2012. Anne is very passionate about her work, which is clearly demonstrated in her commitment and dedication the program. She has continually demonstrated her ability to be flexible, creative and patient – all essential skills that have help shape the program to what it is today. Her leaderships skills have brought increased visibility to the District within the Thurston County community, and beyond. James Weatherford, Resource Specialist, received the 2008 Southwest Region Employee of the Year! He was recognized for his hard work at the District. Some of the highlights include: educating Thurston County’s Developmental Services staff on the importance of TCD’s participation in reviewing applications regarding agricultural land use conversions, so that TCD can directly influence the outcome of projects and proactively preventing water quality problems before they can occur, and for co-chairing a statewide group in bringing affected parties together to developed a standardized conservation plan format. The Thurston Conservation District received the 2007 Natural Resource Conservation Service Partnership Award! This award was presented to TCD at the Washington Association of Conservation Districts’ Annual Meeting on November 28, 2007. NRCS recognized us for our cooperative efforts in getting conservation on the ground and assisting them with diminishing their huge backlog of projects. The District received the 2006 SW Region District of the Year Award for the 2nd year in a row! Kathleen Whalen, Administrator for Thurston CD received the 2006 SW Region Manager of the Year award! Mike Kuttel, Jr., Habitat Specialist for Thurston CD received the 2006 SW Region Employee of the Year award! 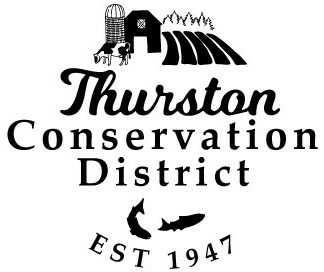 The Thurston Conservation District was awarded with the 2005 SW District of the Year Award, presented by the Washington State Conservation Commission. Doug Rushton, Board Chair, received the 2005 SW District Supervisor of the Year Award! We are proud of our accomplishments and are committed to continuing our efforts in the years to come.